Unlock AQW Gear with the AQ3D Kickstarter Hero Starter Pack! By popular request, the AQ3D team has added Kickstarter backer package below the $25 Guardian package. 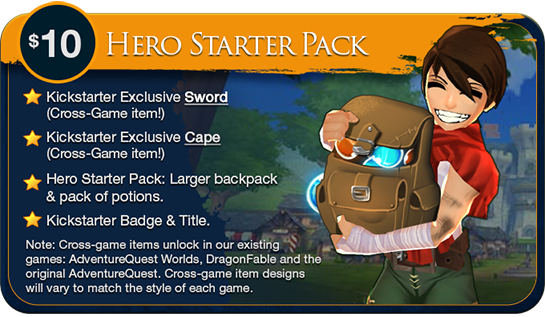 The $10 Hero Starter Pack will come with in-game items for AdventureQuest Worlds, DragonFable, and the original AdventureQuest! If you're already a backer then you know that you get everything at your backer level AND everything in every backer package that came before it. EXAMPLE: If you're pledge $500 for the Design-A-Weapon Package, you also get everything that comes at the $120, $60, $50, $25, $10 and $1 backer levels. This INCLUDES the new $10 package. Everyone who has already backed us at the $25 Guardian level or higher will also get everything in the new $10 package. We could have made it a $10 add-on but we're not trying to milk you guys. We need the funding to make AQ3D but we also want you to feel like you're getting a deal for your pledge, so we included this package for everyone who has already backed us and anyone who pledges $10 or more from now on. We hope that this added a little sugar on top of your existing pledges. To see all the rest of the news from Cysero's latest AQ3D Kickstarter update post, head to the AQ3D Design Notes!